Called "Grote Markt" in Dutch and "Grand Place" in French, Brussels' town square (or "old market square") is an architectural marvel of Brabantine Gothic, Renaissance and Baroque styles. The square is surrounded by the Houses of the Guilds (or Guildhalls), the Town Hall and the King's House. The Town Hall (Hôtel de Ville in French) was constructed between 1402 and 1455 and was the only building to escape French bombardment of 1695. The 96m high gothic tower was designed by architect Jan Van Ruysbroeck. 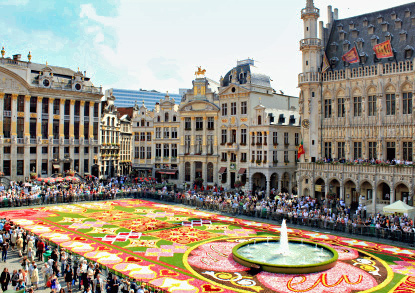 It is adorned with a golden statue of St. Michael, the patron of Brussels, at the top. The King's House (Broodhuis in Dutch, Maison du Roi in French) was originally a bakery in the 13th century, and was replaced by the present stone building in the 15th c . as an administrative building for the duke of Brabant. It was restored in neo-gothic style in the 18th century. It is somewhat of a misnomer as no kings ever lived there. 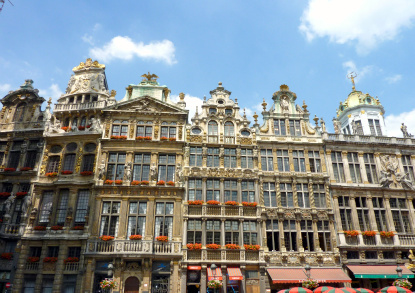 It now houses the Brussels City Museum (open Tue-Fri 10am-5pm, Sat-Sun 11am-5pm; admission 3 €), which has various historical relics, including a floor painting by Pieter Bruegel the Elder of 1567. That is also where Manneken Pis' wardrobe (see below) is kept, with only about 100 on display at a time. Most buildings around the square were destroyed in 1695 by French troops led by De Villeroy as retaliation for the lost battle of Namur. The guild houses were rebuilt in Baroque style. 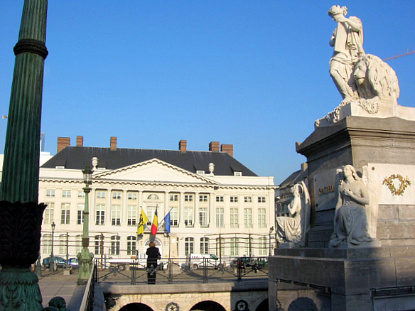 The world-famous statue of the small peeing boy has become an emblem of Brussels. Many tourists are disappointed by its unimpressive size, but what matters is its history behind it. Manneken is also famous for his wardrobe, with some 725 costumes used for various occasions, from Christmas and local festivals to sports events. The costumes are kept in the King's House on the Grand Place. There are several legends about the origin of Manneken Pis. The most famous is the one about Duke Godfried II of Brabant. In 1142, the troops of this two-year-old lord were battling against the troops of the Berthouts, the lords of Grimbergen, in Ransbeke (currently Neder-over-Heembeek). The troops put the little boy in a basket and hung it in a tree, to encourage them. From there, he urinated on the troops of the Berthouts, who eventually lost the battle. Another legend goes like this: in the 14th century, Brussels was under siege by a foreign power. The city had held their ground for quite some time. The attackers had thought of a plan to place explosive charges at the city walls. A little boy named Juliaanske ("Little Julian") from Brussels happened to be spying on them as they were preparing. He urinated on the burning fuse and thus saved the city. Yet another legend has it that a little boy peed on a witch's doorstep, and the angered witch turned him into a statue. There was already a similar statue made of stone in the middle of the 14th century, perhaps as early as 1388. The statue was stolen several times. In 1619 it was replaced by a bronze statue, created by Franco-Flemish Baroque sculptor Jerôme Duquesnoy. Manneken Pis stands proudly near the Grand Place, on the corner of Rue de L'Etuve (Stoofstraat) and the Rue du Chêne (Eikstraat). There is also a Jeanneke Pis, the female version of Manneken, squatting in Impasse de la Fidélité off the north-western part of Rue des Bouchers. The statue was built in 1985 by Denis Adrien Debouverie. If you haven't had your fill of indecent statues, the dog version known as Zinneke Pis with its leg cocked, stands at the corner of Rue des Chartreux and Rue du Vieux Marché aux grains. This one was designed by Flemish sculptor Tom Frantzen and represents Brussels' irreverent spirit. The area around the Grand Place is known as the Ilot Sacré ("Sacred Isle"). 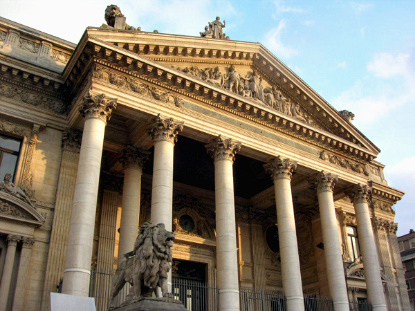 About 100m north-west of the Grand Place is the Brussels Stock Exchange (Bourse/Beurs), a beautiful neoclassical construction from 1873. Immediately north-east of the Grand Place are the Royal Galleries of Saint-Hubert (Galeries Royales Saint-Hubert in French ; Koninklijke Sint-Hubertusgalerijen in Dutch), inspired by the Uffizi Gallery in Florence. They are composed of the Queen's Gallery (Galerie de la Reine), the King's Gallery (Galerie du Roi), and the Prince's Gallery (Galerie du Prince), divided by the intersecting Butchers' Street. They are some of Europe's most lavish shopping arcades, and were in fact the first shopping galleries to open in Europe when they were inaugurated by King Leopold I in 1847. You will find mostly posh boutiques selling refined clothes, classical music, antiques and, well, chocolate (it's Belgium after all), with numerous cafes and restaurants in between. The galleries are intersected by the famous Butchers' Street (Rue des Bouchers / Beenhouwersstraat). It does not owe it name from a particularly barbaric battle, nor to the presence of serial-killers, but to the old guild of the butchers which was once doing business here. It is now filled with meat and seafood restaurants from one end to the other. It is mostly a tourist trap though. A few hundreds metres north from the stock exchange is the Royal Theatre of the Mint (Théâtre Royal de la Monnaie/Koninklijke Muntschouwburg), which also acts as Brussels' opera. It marks the entrance to the city's most popular shopping street, the Rue Neuve (literally "New Street"). A side street to the east leads to the magnificient neo-classical Martyrs' Square (Place des Martyrs). Copyright © 2004-2019 Eupedia.com All Rights Reserved.